Purchase these beautiful Christmas decorations early. These elegant ornaments will not last long! Start a new tradition and purchase one of these beautiful Christmas ornaments each year for a special person in your life for a lovely Christmas memory they will cherish each year as they unwrap the decoration and display for all to enjoy. Deep red decoration with a vintage look that appears to have hung on many trees. 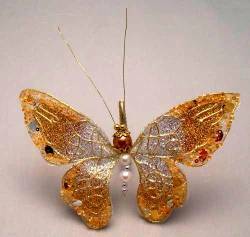 Delicate gold butterfly with iridescent amber and red jewels that reflect the light. 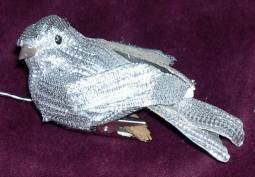 This bird has a clip to easily attach to your Christmas tree or wreath. 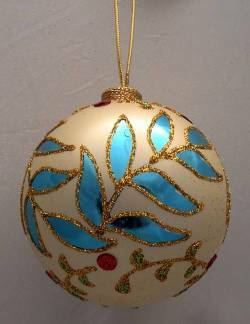 Tear drop clear glass ornament richly decorated in gold and accented with blue crystals. Elegant round glass ornament richly decorated in gold and light blue beads. A plastic drop chandelier with silver beads looks like real glass and reflects light. Elegant eight inch long glass teardrop shaped ornament with pretty silver glitter swirls. A pair of elegant opaque ornaments decorated with pretty snowy boughs. Winter white ornament decorated with blue and green leaves with red dots for accent. 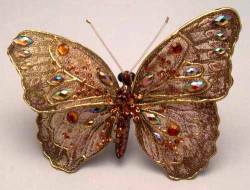 Beautiful ornate gold and silver butterfly with a body made of large beads. 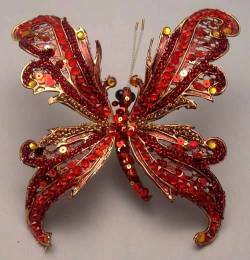 Beautiful red and gold scalloped wing butterfly decorated with brilliantly colored beads. 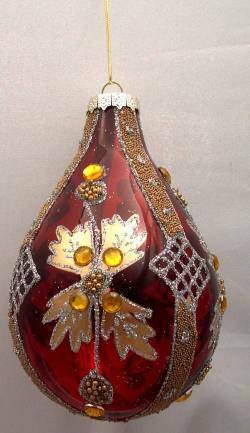 Bright red teardrop ornament ornately decorated with gold and silver glitter. 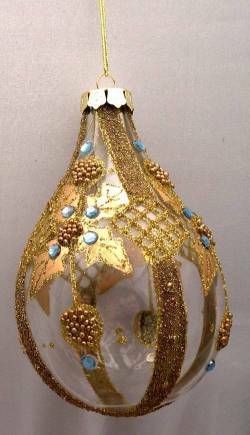 Elegant teardrop glass ornament richly decorated in gold and light blue beads. 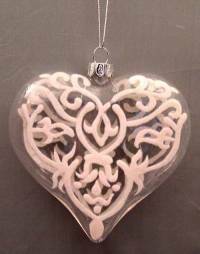 Clear glass heart shaped ornament decorated with an elegant scroll pattern. 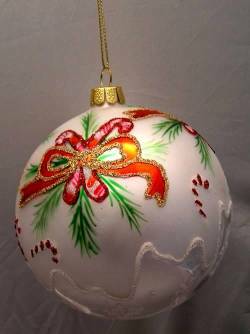 Lovely red teardrop shaped ornament decorated painted to look like a snowy pine tree. A pair of beautiful red ornaments decorated with red glitter and accented with red rhinestones. Pretty silver round ornament decorated with candy canes, pine boughs, and snow drifts. 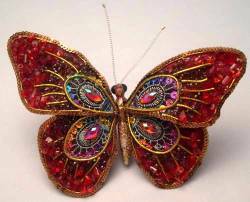 Beautiful red beaded butterfly with colorful blue and pink beads trimmed in gold. 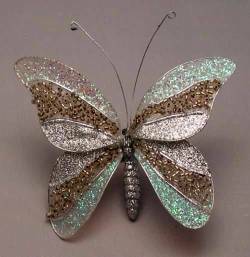 Pretty butterfly decorated with lots of silver glitter and gold beads. 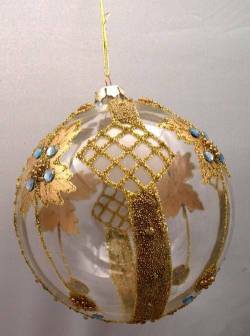 Round clear glass ornament richly decorated in gold and accented with blue crystals. 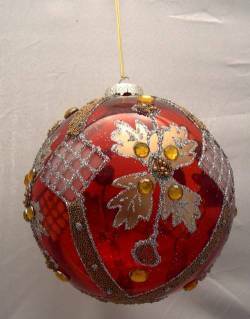 Bright red, round ornament ornately decorated with gold and silver glitter. 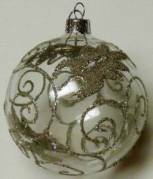 Elegant eight inch glass ornament with pretty silver glitter swirls. Pearlized glass ornament decorated with green and red glitter holly. This pair of red ornaments is richly decorated with soft felt and red glitter.